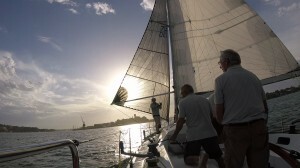 Tonight was the resail of the Australia Day Regatta at Greenwich Flying Squadron and after last weeks postponement due to strong winds we had a fickle breeze with something for everyone. 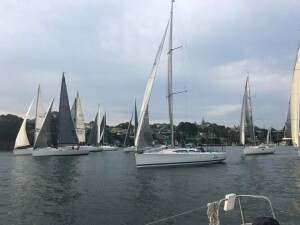 We started well winning the start and were first into Humbug where we were promptly becalmed and in a very short time went from first to last. The breeze was coming straight down Humbug so we were blanketed by the fleet and with the disturbed air on the Onions Point side swirling we were trapped into repeated gybes. Midstream there was not much more breeze but it was from a more consistent direction. A photo from the Greenwich Flying Squadron Facebook page shows the position well. Only after the fleet sailed by did we get clear air and a chance to start the chase. We worked to windward enough to clear the mighty Ausreo but went low below Fireball. We took the stern of a starboard tacking Etchell but Fireball had to take more drastic evasive action and so we had clear air above. 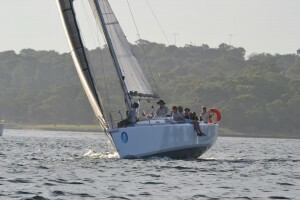 Jackpot had taken the same Onions Point shore where we were overrun by the fleet and did not do well on that side. At Cockatoo Island Joli and Irukandji were in the mix with Utopia, Avalon, Dump Truck and Much Ado V and there was a large break back to Passion X. Around Cockatoo Island there was a lot of traffic from the earlier starting fleets and we took the low side for safety. Jackpot rounded a little later and with less traffic and took the high side setting up a very close tussle for the rest of the race. 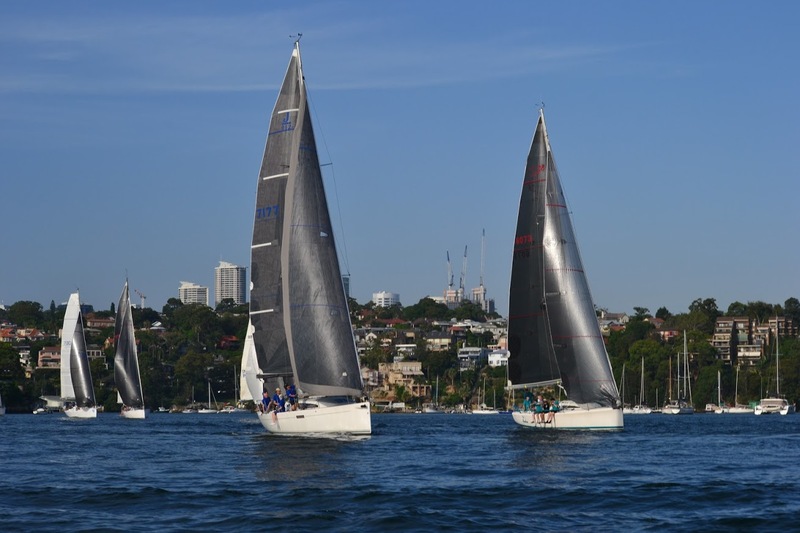 We picked the breeze shift well off of the Greenwich baths and also were lucky to tack on a brief header near Balls Head to keep us in touch with Jackpot and make us some ground on Irukandji and Joli. Around Goat Island the four of us bunched up but we were last to exit and still trailing. The leg back around Long Nose was very fickle and perhaps the one we played the best going first to leeward and then staying on the starboard gybe past the point. I expected the gybe back to port to be very square and wanted the jib swapped over but the wind headed quit sharply and we were now beam reaching back to Cockatoo. 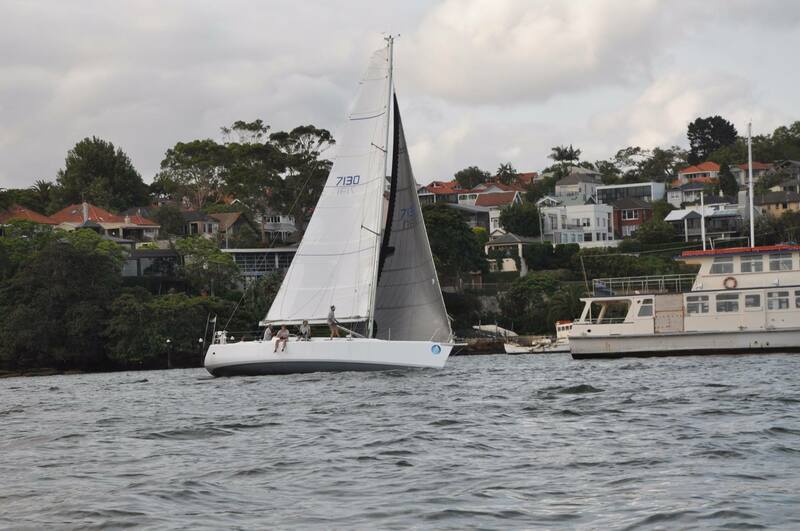 The two Sydney 38′s and the two Ker 11.3′s were long gone but we had a race keeping in front of Jackpot, Irukandji and Joli. Jackpot was still alongside down the Cockatoo shore and only our inside position and starboard gybe gave us rights and room to just get our nose in front on the rounding. With fresh air first around Cockatoo we drew away from Jackpot only to die off of Clarke Point and have them come alongside again. In the close tacking up Humbug we went as close as possible before calling room to tack on Jackpot and later on the white fleet Jaytripper. The extra few yards added up but the time we exited Humbug and reached away for a narrow fifth fastest. 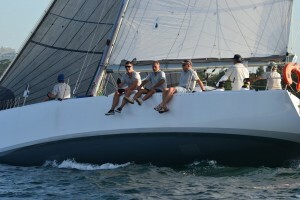 Dump Truck skippered by Darren Beck and family took the first and fastest result while Irukandji finished second on handicap and Much Ado V third. 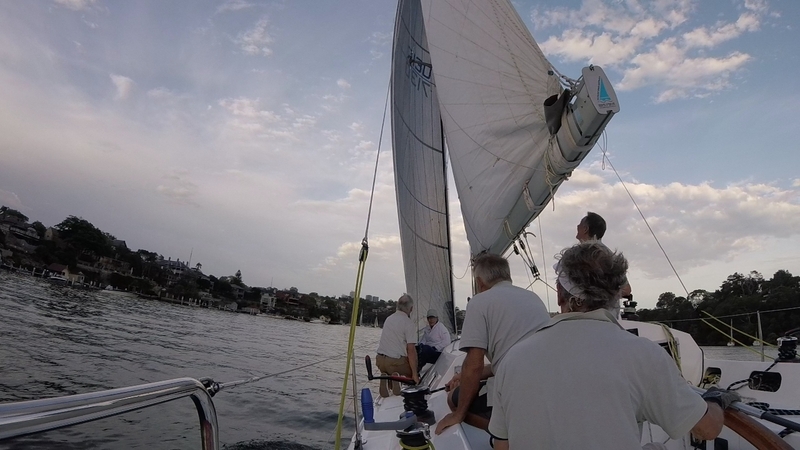 For tonight’s race I put a sliding ring on the mainsheet bridle. The idea is that in strong gusts the ring will move to leeward and drop the boom. It worked very will in the heavy gusts and while we tracked a little lower I felt we were faster. On the reaches it was very effective and in my mind something to retain. It is still work in progress as in light air we need to be able to centre the boom with less mainsheet tension so there will be more experiments. A very nice two tacks off of Balls Head was a bit of a saver for us. The work home through Humbug was also a highlight. 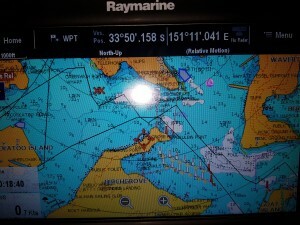 In Humbug all the fleet reaching passed Passion X and Jackpot becalmed on the Onions Point side. Too much wind and more tiny improvements. Last Wednesday the racing was cancelled due to the wind exceeding the GFS regulation strength for racing. It was a bit sad as an hour later the conditions had abated and would have made for good fair and safe racing. 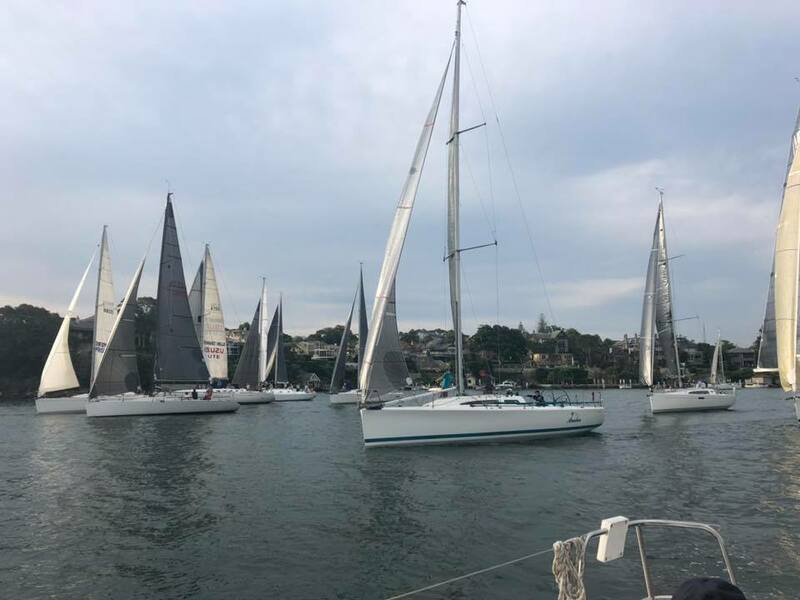 It is not possible to delay the twilight races that long as they would then become night races so we had to be content with a very pleasant BBQ on the deck with the loyal GFS members and crew who came along to support the financial cost of running the function. I had been looking forward to a good breeze to blow away the memory of my less than stellar performance in the Laser the previous weekend. 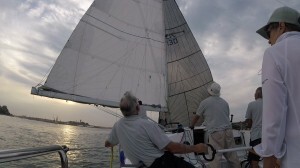 As luck would have it we had the big blow on the day I sail with the large rig and next to no breeze on the Sunday when I sail with the smaller radial rig. 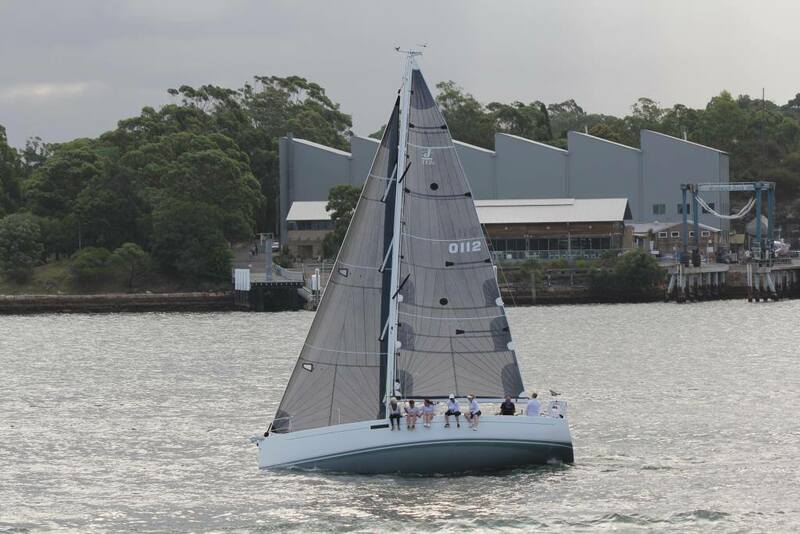 I don’t complain when it is vice versa and for Australia Day I did get to sail the smaller rig in a good breeze at Gosford in a novelty race down Paddy’s Channel and back up the Woy Woy Channel. Absent sailing on Passion X I have been attending to some small improvements of which some are cosmetic and unseen like routering the underside edges of the floorboards and re doing the epoxy saturation of the edges. Taking the back corner off the floors makes it easier to tilt them up and place them back and the epoxy saturated rounded edge is more durable than a sharp corner. The ends of the full length battens had been fattened up with tape to fill the batten pockets but that had worn away over time so I augmented the ends with thin batten strips glued and taped to the ends so that the battens now fit tightly into the pockets. Hardly something you would notice but it should improve the shape of the mainsail off the mast. While the high strength epoxy on the batten ends was curing in made up a stronger bridle for the mainsheet. There are two lines with splice on both ends and they have to be identical length but I had plenty of time waiting for the epoxy to cure to do a precise job. Not a functional improvement but an increase in factor of safety. Our non skid on the deck is a bit harsh so I smoothed the section on the cabin where the ropes on the starboard side run to the Spinlock jammers. This should help the sheets to run more freely and if it not too slippery under foot I will do the other side too. The starboard side has the mainsheet, the first reef line, the masthead spinnaker halyard, the spinnaker pole topping lift and the spinnaker pole kicker so that is where most of the action is. If it is a big success I might even over coat it with some two pack polyurethane to seal the remains of the non skid granules. The last task of significance was to check our first reef set up. Our front reef line comes out of the top of the boom and is quite a long way back from the goosekneck. The take off point on the sail had already been moved back but with the shackle onto the take up point there was too much swing aft and the sail was pulling hard on the slider above the reef point. I removed the shackle and attached the reef line directly to the sail to reduce the swing aft with immediate improvement. For good measure I lengthened the tie from the main to the first slug above the reef point and it all looks a lot better. 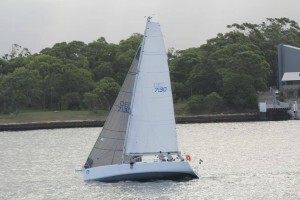 I am now looking forward to a bit of a blow where we can try out the improved reefing lines and also the tighter V1s. Perhaps this Wednesday the wind will be just right. We had already updated our Cat 4 safety certificate with the latest expiry dates for the renewed insurance and some inspections but I finally purchased a 12.5 mm bolt cutter as the emergency rig removal equipment. Hopefully it will never be needed but after trying to cut up some 10 mm chain with hacksaw and angle grinder I realised that these were not practical alternatives. Pulling the split pins will still be the first line of attack but if they cannot be removed then the bolt cutter will be quick and effective. By Friday there were some great photos posted on the Greenwich Flying Squadron facebook page by Simon Elliott. The photos tell the story very well. 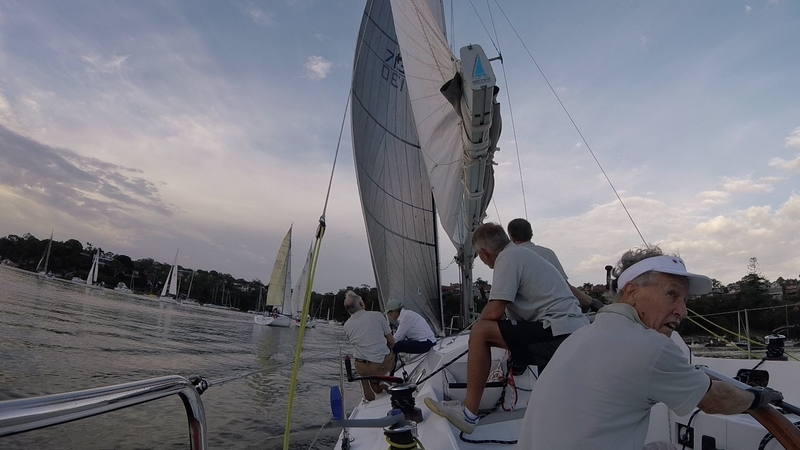 There were two moments of pain in tonight’s race at Greenwich Flying Squadron. 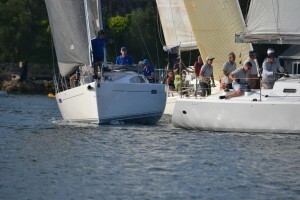 After a good start we were run over by most of the fleet going through Humbug. Much Ado V with nice free leeches on main and jib drifted past while Fireball came through with fresh breeze to pass us both. We were holding our position from around Cockatoo Island until the pain started. The first was on the approach to Goat Island when Utopia lifted from below and maintained the lift all the way to a knock at the island shore while Jackpot crossed on starboard and tacked in our air. The disturbed air forced us lower and slower and adding insult to injury the tack back was away from a new lift. 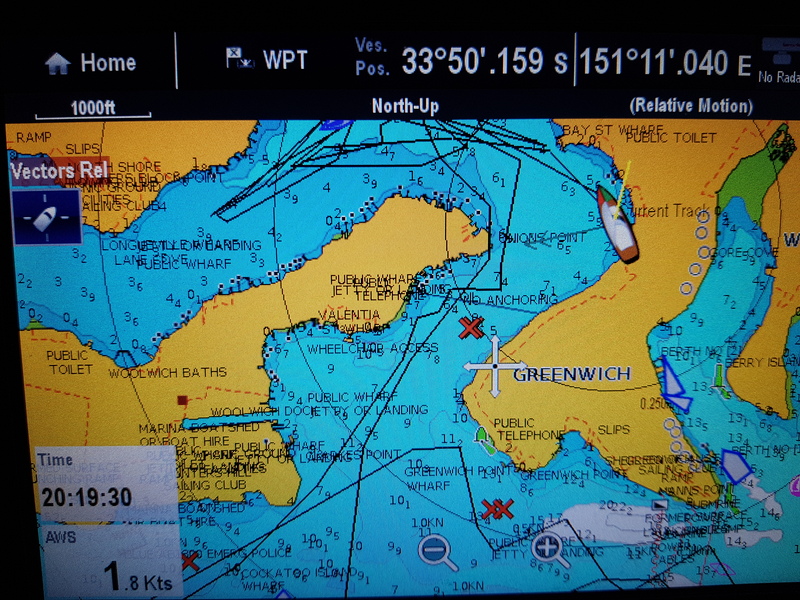 The chart plotter tracks show our tortured route to the navigation mark but now we were reaching and hoping to make up ground on the six yachts ahead. Jackpot, Meridian and Joli were tantalisingly just ahead but already lifting into new breeze from around the island while we fell into a deep hole from which it took at least two minutes to extract ourselves. Once around the island and into fresh breeze we hoped to make up some ground but the wind angle was not helpful. The breeze went over square on the starboard gybe to Cockatoo Island forcing a gybe to port and later back to starboard. Non of this helped to make up any time so we rounded Cockatoo Island without making up any ground. Our last hope was for a good passage through Humbug but a dying breeze did not cooperate and we lost further ground to be nine minutes off fastest time. The real pain was not participating in the close racing at the front of the fleet where third to sixth fastest were within a minute of each other. The dying breeze explains some of the pain but it did not die enough for us to beat Ausreo or Fireball on handicap. After them however it did die even further leaving Lisdillon a lonely figure fourteen minutes behind Ausreo on fastest times and saving us from the handicap wooden spoon. All in all it was a frustrating evening. The heavy boom closes the mainsail leech as soon as the breeze dies and we need drop the halyard enough to sit the boom on the solid vang. Nothing has changes since we had a first and fastest three races ago and hence the frustration. The Start. We were a bit early an that let Meridian bear away below us as we luffed to avoid going over the line. The pain in Humbug with Passion X between the breezes and blanketed on both sides. We had to go to starboard tack to have rights on the fleet running up from behind. Thanks to the photos posted on the Greenwich Flying Squadron facebook page by Christian Charalmbous I have found out where Joli and Avalon disappeared to out in front of the Black fleet. 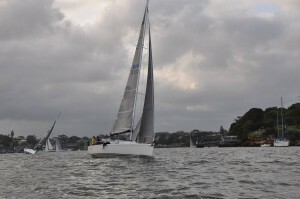 Approaching Goat Island for the first time they are a long way in front of the fleet. Avalon to leeward along the Balls Head shore looks to be in front of Joli to windward and if the sequence of Christian’s photos are still in order then Avalon rounded Goat Island first. Joli deserved their win and the photos show that in the strong winds all of the crew were hiking hard on the windward rail. This is a great example for the rest of us as it gets the weight out of the stern and into righting moment. Much further back in the fleet Passion X appears to be trailing the fleet and leaning very hard in an early gust. 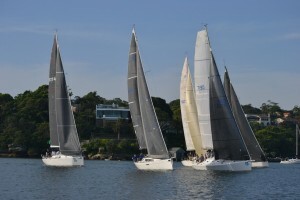 As the breeze lightened we did make up a lot of ground and I am happy with our performance once we rounded Goat Island in lighter breeze. After our win the previous week when I had removed a few sails to lighten the boat. That probably did not help in the initial strong wind phase last night but did help as the breeze died. Today I removed our No 4 genoa and safety equipment surplus to our Category 7 requirements. At home I have weighed all the equipment and as of today 164 kg has been removed from Passion X. There is still a code zero and a few fenders to come off so in total we might just get to removing 200 kg. 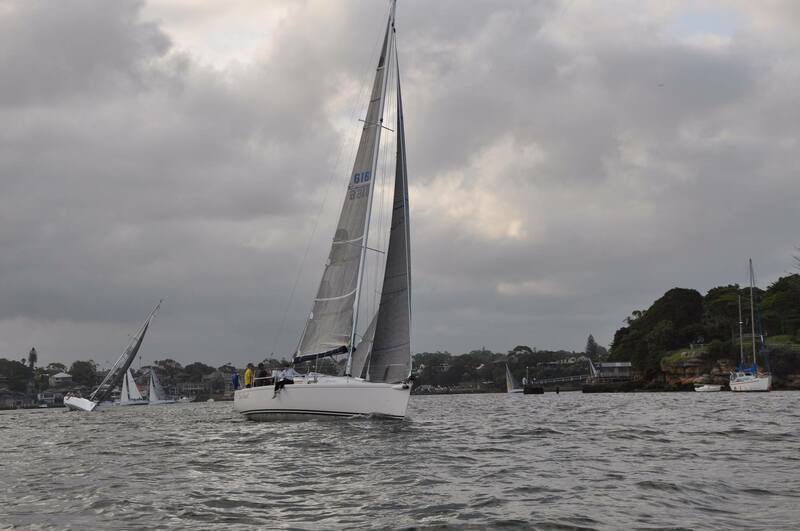 Avalon and Joli approaching Goat Island photo courtesy of Christian Charalambous. Last Saturday the hot North West winds, the fresh North East sea breeze and a southerly changed battled it our and converged on the Gosford Sailing Club course where peak velocity was 37 knots. The weather pattern today looked very similar but with the convergence a bit further north and inland so we took the forecast of 20 knots at face value and set the old smaller genoa from the original Passion. The rig was fine but our execution of the start was lacking. 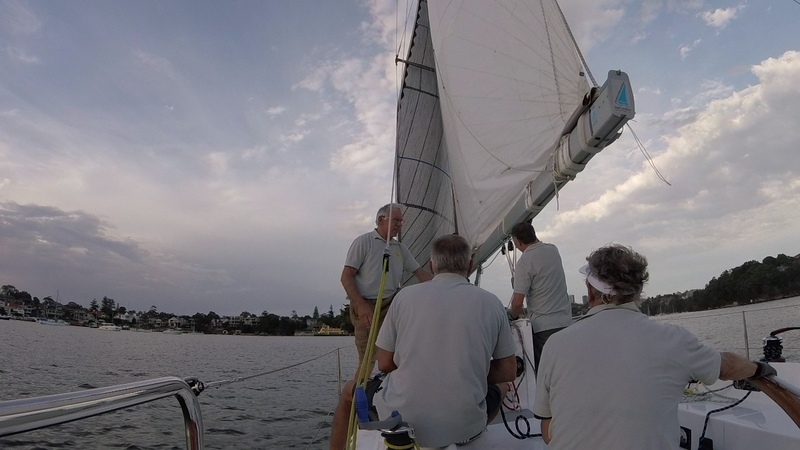 The plan was to start on port with speed but a bit of east in the breeze allowed everyone else to starboard tack the line so we ended up low and slow pinching to Onions Point. Joli and Avalon disappeared somewhere and were not seen until the final work back into Humbug so no comment can be made about their sailing. We were seriously headed in Humbug and still pinching to clear the moored yachts when Utopia from behind came through with breeze. 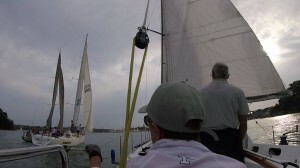 Next Fireball came charging through well to windward while we tried to sail behind Utopia in their dirty air. Not far in front of Utopia we could see Meridian and looking behind we found Irukandji lifting inside us on a huge lift. At this stage we had no one below to worry about and plenty in front and to windward drawing away. Meridian tacked to get over to the lifting breeze just as the lift reached us and that gave us our first small gain. That was our last gain on the way to Goat Island where in the lee of the island there was a large wind shadow. Taking advantage of a shifty breeze we managed to overtake Irukandji and around the Island somehow crept up to fifth fastest. 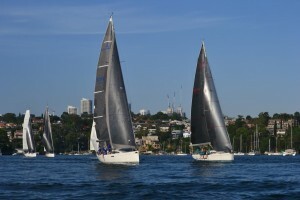 Utopia and Meridian were quite a few boat lengths ahead but Joli and Avalon were out of sight already around Long Nose on the way to Cockatoo Island. We gained a little on the run and reach to Cockatoo island and were quite close at the western end only to give it back again by going in too close to the wind shadow. Irukandji and Fireball came around with good breeze causing quite a bit of consternation until we reached clear air and took off again. On the way back to Goat Island Utiopia lifted nicely around the deep water mark off Balls Head while Meridian and Passion X were headed into the rocks and had to tack away. This was the last chance we had of overtaking Utopia as the favourable wind shifts gave her a good break on us. We tacked back to starboard below Meridians Line and she was rewarded with a big lift around the navigation mark while we sailed a longer outside route. 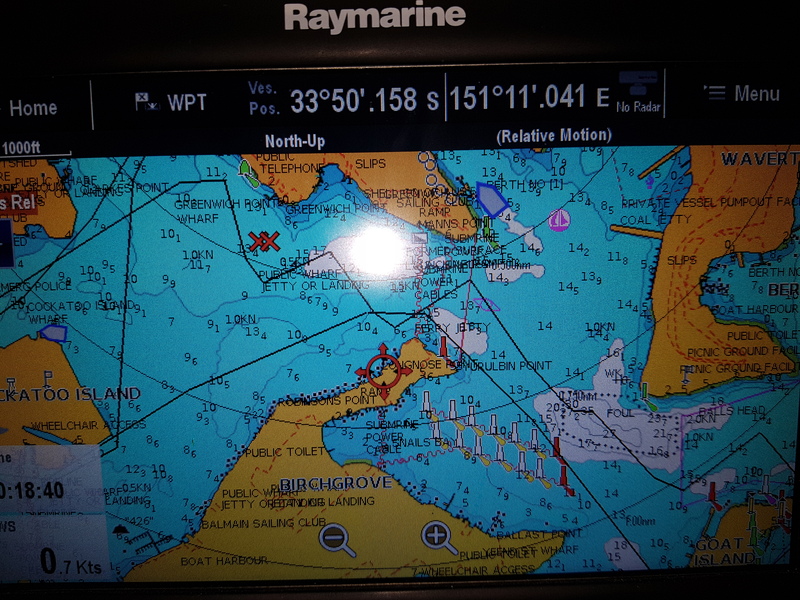 The knock back was our chance to tack and bear away a little for speed so that around Goat Island we were within catching distance of Meridian. The rest of the run and reach back to the finish line at Greenwich Flying Squadron was all about taking time out of Meridian. We had established a good lead over Sweet Chariot, Fireball and Irukandji so did not need to cover. Approaching Humbug we noticed Joli ahead and Avalon returning from a long detour but we had eyes only for Meridian. In the end we failed by seven seconds but were overlapped as we crossed the line. Ahead Joli was four minutes clear and first on handicap. She must have had her own quiet patch as she seemed much further ahead as we rounded Cockatoo the last time. Behind Sweet Chariot and Fireball came through with a squirt of fresh breeze improving their handicap results prospects for a second and third respectively. Utopia took the fourth spot by 50 seconds from Passion X and that lift around the Balls Head navigation mark was worth much of that. 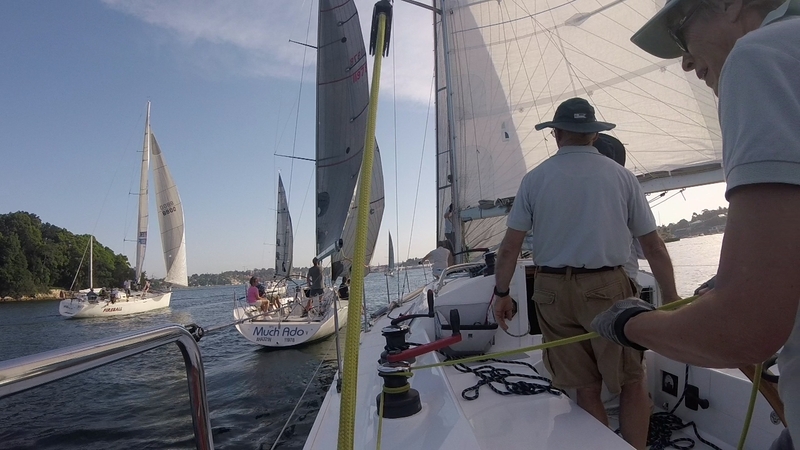 While we were disappointed with our start, yachts from behind got the better of the breeze through Humbug and overtook us. 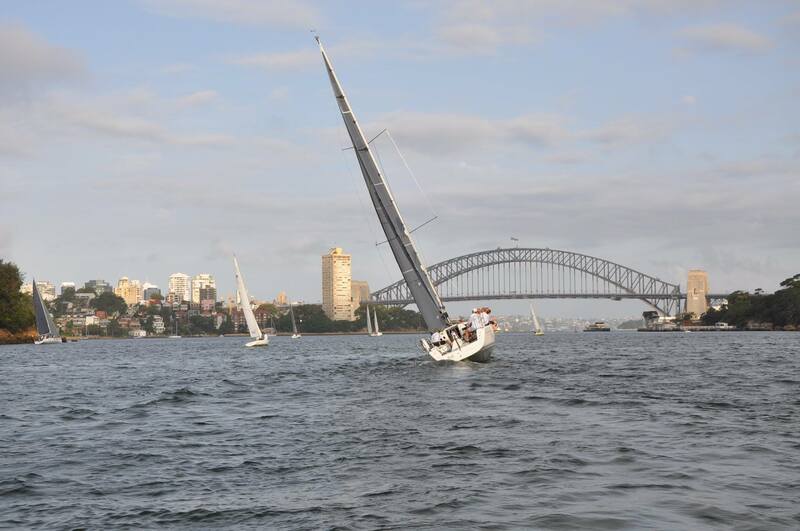 Our first work to Goat Island was average but once at Goat and with a fading breeze we sailed well. Top boat speed for the night was 8.9 knots with quite a bit of the reaching at the high 7 knot mark. Utopia did well to pull away 3 minutes from us and Meridian but that was to be expected in the fresher conditions. Passion X working out of Humbug. Photo courtesy of Mark Palmer and the GFS facebook page. Just our weather or reward for tuning. In very light conditions a clean bottom does help and the divers gave Passion X a good scrub today just before the race. 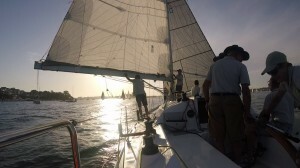 I had taken two spinnakers off to lighten the boat and with three of our crew away we were manned by the lightest contingent we have had on board for a long time. As well Don and I spend some time adjusting the shroud tension and putting a little more bend back in but at the same time stiffening the rig with that bend in place. Also in the very light conditions we lowered the mainsail until the load of the boom was taken on the rigid vang and used the main halyard for leech tension control. Sort of like sheeting the main from the head and not the boom. Whatever the reason all the rig seemed just right for the day and we felt more in control than usual. 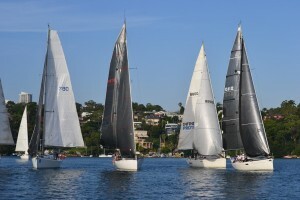 The start favoured the leeward yachts for a while but once they cleared Onion Point they were headed severely. 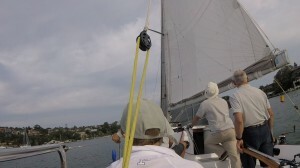 We were still on the club side of the point and could tack to starboard and take a leg out from the point on a good lift. When we tacked back we took the stern of Avalon and worked further along the Onion Point shore before tacking back now in front of Avalon. Meridian was still clear ahead but we lifted inside her line and made up quite a few boat lengths. For a few tacks the positions see sawed until we lifted along the Snails Bay shore while Meridian closer to Balls Head knocked looking at our stern. 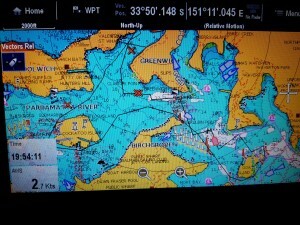 We covered and maintained a position to windward going to Goat Island. 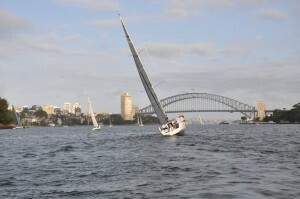 The lead stayed much the same all the way to Cockatoo Island with Utopia and Avalon catching up with following breeze. We had a bit of a scare approaching Cockatoo as the breeze headed quite sharply while we had the headsail out on the 6 metre pole. I had to square away to get the pole down and then found ourselves quite low on the line to the Island. Fortunately we had breeze and a good angle to recover our position. Around the western end of Cockatoo Island the breeze deserted us and what was left was shifting. Behind Meridian’s genoa was drooping just as much as ours but i was concerned for the breeze bringing them and the now much closer Utopia and Avalon down on top. Our position in front was rewarded with the first breeze over the end of Cockatoo and we shaved the shore line keen to clear Clarke Point without tacking. That worked nicely but once beyond Clarke Point the breeze went away for a long rest. We could see the Blue fleet returning directly from Goat Island and struggling with little and erratic wind. 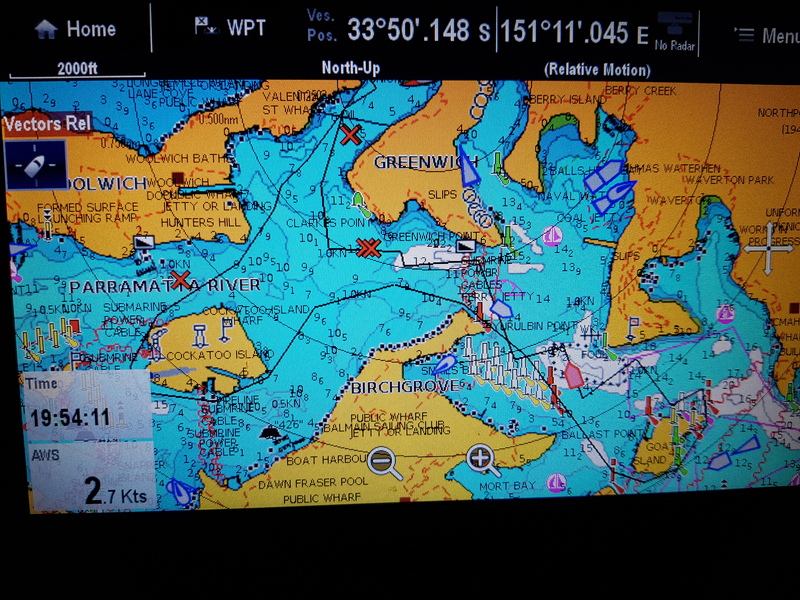 The crew made some good calls and we flopped from starboard tack heading to Onion Point to port tack heading to Onion Point almost effortlessly. Next we flopped back to starboard to clear Onion Point and the tracks show little deviation from a straight line to the finish. In similar conditions we have several other fastest times results and on three occasions out relative performance had been better but this was enough to take the double first and fastest. Only time will tell if the tuning has paid dividends but we are getting more comfortable in a breeze and hopefully more consistent.